How can the capacity of multiple NICs be combined for virtual servers to use while improving availability? The capacity of individual NICs may be insufficient to guarantee virtual server availability. A single virtual switch is used to leverage multiple physical uplinks at the same time. Multiple NICs are bundled together, assigned to a virtual switch, and configured for concurrent usage. The physical NICs assigned to Virtual Switch A act as a team and simultaneously forward packets to balance the load. 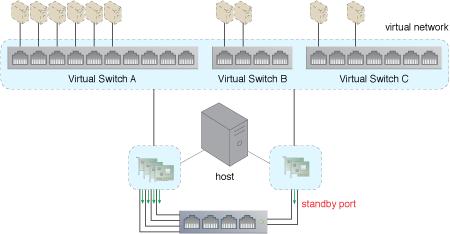 However, one of the two NICs that are teamed up for Virtual Switch C is not required to simultaneously forward traffic from both NICs. Instead, that NIC has been configured as a standby NIC. It will take over the forwarding of the packets to maintain redundancy and high availability, should anything happen to the original NIC. Six physical uplinks are added to Virtual Switch A. Physical Switch A is now connected to the six physical uplinks. This pattern is covered in CCP Module 17: Advanced Cloud Virtualization.